Unfortunately for Pereira, it was the Warriors’ doubles players who rose to the occasion and won four of nine sets to edge the Titans, 10-8. San Marino No. 1 doubles Katie Kirkendall and Elaine Wu and No. 2 duo Caitlin Nguyen and Rakel Ang won two of three sets but were unable to pick up a win over Rachael Sherill and Emma Victor. 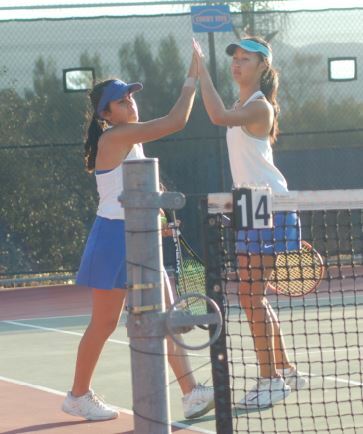 Rakel Ang and Caitlin Nguyen won two of three doubles sets in San Marino’s CIF-SS Division 1 quarterfinal at Westlake on Monday. Pereira was hoping one of his doubles teams would upset Westlake’s duo but Sherill and Victor came away with a sweep, 7-5, 6-3, 6-3. 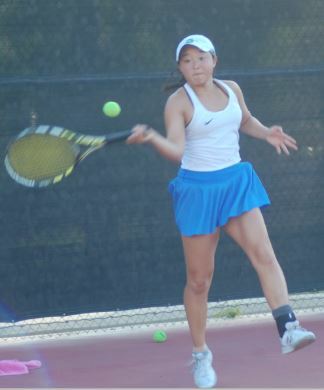 Grace Carter and Kayla Chen contributed one doubles victory, and Anessa Lee, San Marino’s lone ranked player, won all three of her singles matches, 6-3, 6-2, 6-2. Despite the tough, disappointing loss at Westlake, the Titans had a remarkable season with a young, inexperienced squad. Anessa Lee won three singles sets in the Titans’ 10-8 quarterfinal loss to host Thousand Oaks Westlake on Monday. They managed to win the Rio Hondo League championship and defeated Orange Lutheran and San Clemente in the first two rounds of the playoffs. The season is over for all but three Titans. Lee won the Rio Hondo League singles tournament and duo Rakel Ang and Katie Kirkendall placed second in the doubles tourney. All three qualified for the CIF-SS Individual Tournament, which will be played on Monday, Nov. 19.